The devastating tsunami that struck Japan on March 11, 2011 left more than 15,000 people dead. Those who barely escaped spoke of the miracles that saved them. This is arguably the most amazing survival story of all — the harrowing account of one man who was swept out to sea by the monstrous waves and spent days stranded on the roof of his home, floating miles away from land. Yet, he somehow lived to tell about it. Scientific research has established that identical twins are not only similar in outward appearance but also in their habits, talents, IQs and personalities. The most amazing aspects of these similarities become apparent in the case of twins separated at birth. Even though they never met and were raised under completely different circumstances, they still share astonishing similarities. Sometimes, the similarities defy explanation — for instance, separated twins who give their children the same names…. The scientific and paranormal converge in this fascinating topic. No chain, cell, safe or chest could keep him under lock. Thousands and thousands of spectators around the world thronged to his fantastic performances, watching openmouthed as he freed himself from every sort of confinement and restraint. Houdini did not possess any superhuman skills. He was simply a master at pulling off tricks that others could not fathom. Learn more about this extraordinary Jewish magician who became a legend in his own time. When they heard there were “rivers of gold,” they came from far and wide. A pristine frozen wilderness was transformed. More than 100,000 prospectors – appropriately called “stampeders” — swarmed the Alaskan and Canadian hinterlands. Chaotic shanty towns of muddy streets sprang up to accommodate the ever-renewing supply of gullible outsiders hoping to strike it rich. It was the perfect setup for one of the cleverest and shadiest swindlers – a man so slippery that he was known as “Soapy.” Would they ever catch him? He Fought The System For The Sake Of Shabbos… And Won! Those living in America for more than 40 years undoubtedly recall the infamous “blue laws” that forbade opening one’s business on Sundays. For most Americans this law was merely an inconvenience, but for Shabbos-observant Jews it posed an impossible choice: work on Shabbos or face severe financial consequences. Zman is proud to present an in-depth discussion of this significant piece of American history. 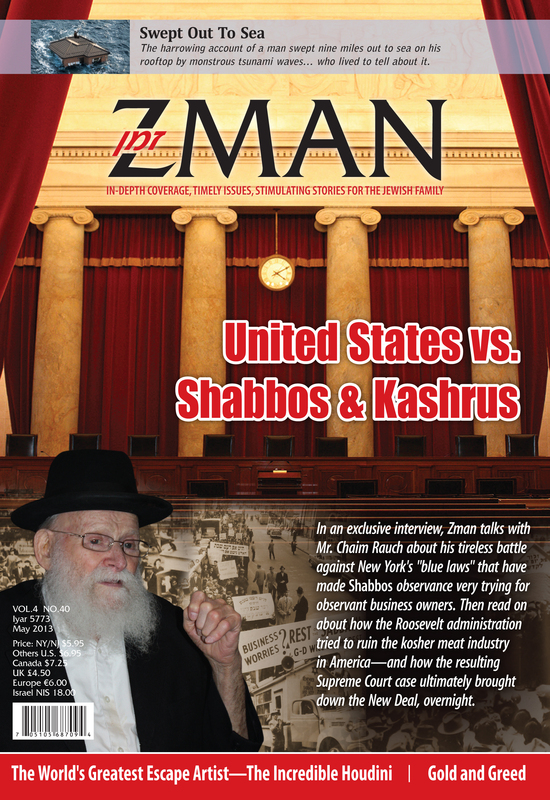 The story is accompanied by an exclusive interview with Chaim Reich of Boro Park, the man who led the fight to enable Shabbos observance in America. Government officials and federal prosecutors conspired with the unions to bring down a large kosher slaughterhouse. The owners were arrested and charged with violating laws that had never before been enforced. A biased judge cooperated with the prosecutors by convicting the Orthodox Jewish owners and delivering a harsh verdict. Sound familiar? This story actually took place nearly 80 years ago, long before the case of Sholom Rubashkin. Read how the US government tried to destroy kashrus in America, but with Hashem’s help the accused emerged victorious. This entry was posted in Zman Magazine and tagged Japan, Kashrus, Shabbos, Tsunami, Zman, Zman Magazine. On July 4, 1976, as dazzling multi-colored fireworks burst high in the sky across the United States, Americans celebrated the 200th anniversary of their country’s freedom. Little did anyone in the land of the free and home of the brave — or anywhere else for that matter — realize that about 7,000 miles away a group of Jews were secretly celebrating their newly-won freedom. For shortly after the stroke of midnight, on that fateful morning 36 years ago, 102 Jewish hostages were being rushed into C-130 Hercules military planes by Israeli commandos who had just pulled off arguably the most stunning rescue mission in history. It’s all in this month’s cover story. The tension. The drama. The shock. The outrage. The ecstasy. And the agony (four hostages and one commando were killed). 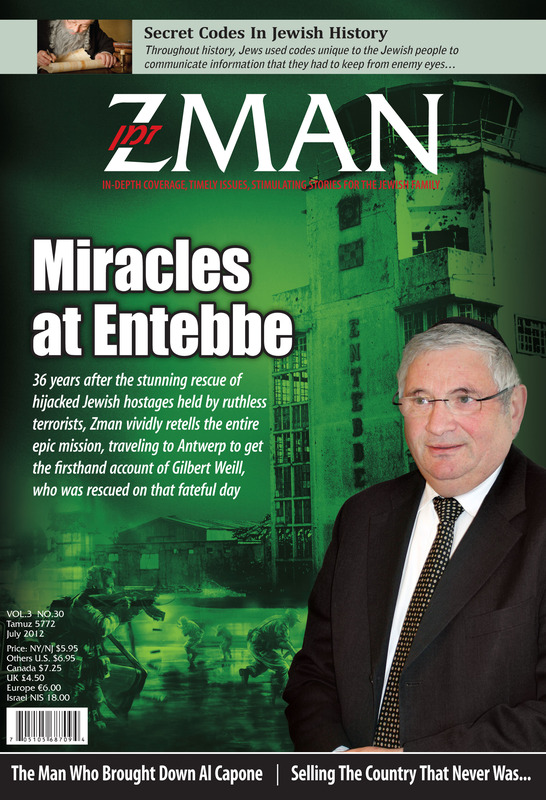 This entry was posted in Zman Magazine and tagged Astor, Entebbe, Idi Amin, Israeli commandos, July 4, Uganda, Yoni Netanyahu, Zman, Zman Magazine. When Islam erupted onto the tapestry of history about 1400 years ago the monumental upheaval it caused changed the face of civilization with astonishing speed. Even while Mohammed lived, Muslim armies swept up from the Saudi Arabian peninsula through Eretz Yisrael into Babylonia and Syria, all the way up into Turkey. Then they swept east into what is today Iraq, Iran and Afghanistan. Next, they swept west into what is today Egypt, Sudan and the northern coast of Africa, including Libya, the subject of this month’s cover story. Our cover story is fascinating for numerous reasons, not the least of which is that it is told through the eyes of Raphael Luzon, whose family roots in Libya stretch back to shortly after the expulsion from Spain and Portugal in the 1490s. Almost five centuries of history were wiped out in 1967 when Arab rioting forced all but a few thousand Jews to leave Libya, including Luzon’s family. In 1969, when the other main character in this month’s cover story, Muammar Qaddafi, ordered the destruction of virtually all remaining vestiges of Jewish life the job was complete. Libyan Jewry had become an echo of the past, a rumor. Hashgachah worked it so that almost a decade before he met his well-deserved demise, Qaddafi felt he needed to make contact with a prominent former Libyan Jew and make amends. Whether he did so exclusively for selfish political motivations or also for some spark of humanity buried deeply in his troubled soul (President Reagan had dubbed him the “mad dog of the Middle East”) is irrelevant. In an impossible-to-predict way that only the Playwright of history could author, Hashem planted in one of modern Jewry’s worst villains the idea to reach out to Raphael Luzon. Luzon saw the invitation — first to correspond by letter and later to personally visit Qaddafi — as an opportunity to advocate for the return of stolen Jewish property, and the protection of the remaining Jewish historical sites in Libya. It’s a fascinating story told with Zman’s characteristic depth, one you are sure to enjoy and learn much from. As we go to print, the headlines are dominated by turmoil in the Middle East. The “Arab Spring” has not brought prosperity, stability or real change to any of the countries swept up in the fervor of the past months. Even Libya, whose overthrow of Qaddafi was widely heralded as a triumph for democracy, is beset by political unrest and the ever-present threat of militant Islamists taking over. Having been ruled by despots for centuries, and with corruption and cronyism endemic to their societies, the “Arab Spring” is looking much more like just another bleak and bloody chapter in the “Arab Winter” of their discontent. Be that as it may, there is only one piece of information we need to know to maintain our equilibrium: The same Playwright who manipulated Qaddafi into listening to Raphael Luzon orchestrates all events. Whatever else we may think we need to do, we first and foremost need to address our concerns to the King of Kings. Our cover story reminds of that in the most profound way. 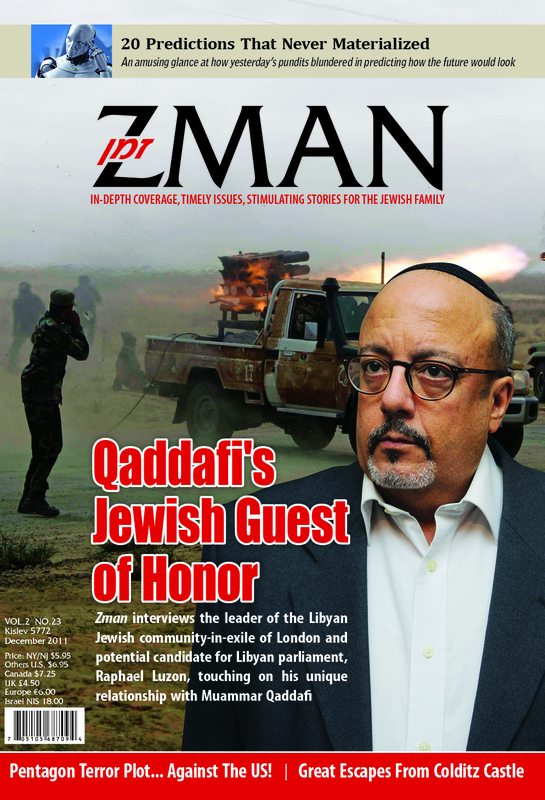 This entry was posted in Zman Magazine and tagged Gaddafi, Libya, Qaddafi, Zman. 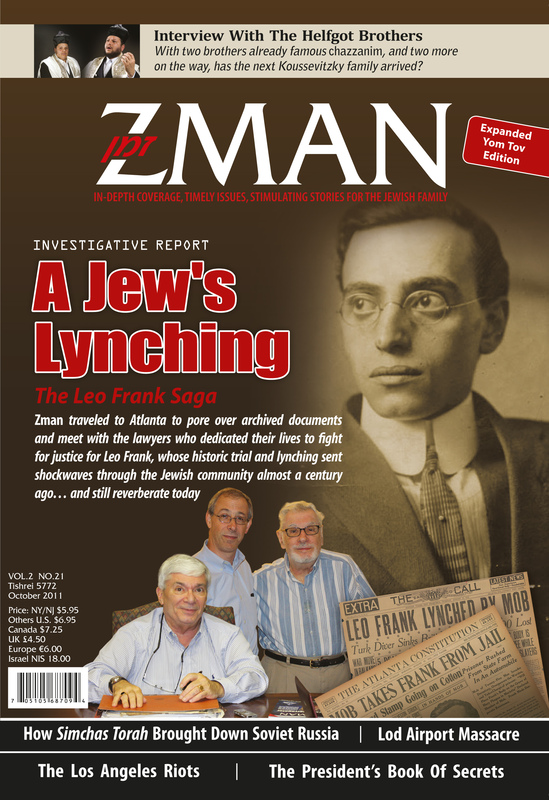 There are many differences between the Rubashkin and Leo Frank cases. I, like so many others, find it incredible that the judge whose judgment was being questioned in the recent appeal was a backup and had influence on the court that reviewed the appeal! This was the same judge, Linda Reade, who was discovered to have had several secret meetings with law enforcement long before the arrests at Agriprocessors (for more details see Zman Sivan 5770/June 2010)! It was Judge Reade whom ICE (Immigration and Customs Enforcement) memoranda indicated had taken an organizational role in the immigration raid; attended weekly meetings; personally requested a meeting with personnel from the many branches of law enforcement who would participate in the raid; and requested updates and final game plans. How can a person work with law enforcement, which worked with the prosecution, and then serve a judge in that case?!? Yet, Reade denied having performed any functions that fall within the executive branch (i.e. law enforcement) which may have reflected an irreconcilable stain on her impartiality. I don’t claim to know American law. Maybe according to the US justice system this is perfectly legal. But, that’s the difference between a man-made law and a Divine one. The Torah tells us: “Don’t take a bribe, for bribery blinds the eyes of the wise and perverts the words of the righteous” (Devarim 16:19). The emphasis is on “the wise” and “the righteous.” Even they can be blinded by impartiality. The Gemara offers several cases of Jewish judges who disqualified themselves for even the minutest influences. When Shmuel was walking on a bridge and a man lent him a hand, Shmuel disqualified himself from judging his case. When Rebbi Yishmael b’Rebbi Yossi encountered a sharecropper who did him the tiny favor of bringing him his fruit a day earlier than usual he disqualified himself from judging his case. Indeed, as Rabbi Yishmael listened to the case (as an observer) he found himself conjuring up arguments in favor of the sharecropper. This issue of Zman comes out during the Yemei HaDin, “Days Judgment.” If we make an extra effort to painfully examine where we are being moreh heter on ourselves, maybe in that merit a measure of objectivity will descend upon those with power over Sholom Rubashkin’s life and help them come to their senses long before they did in the case of Leo Frank. 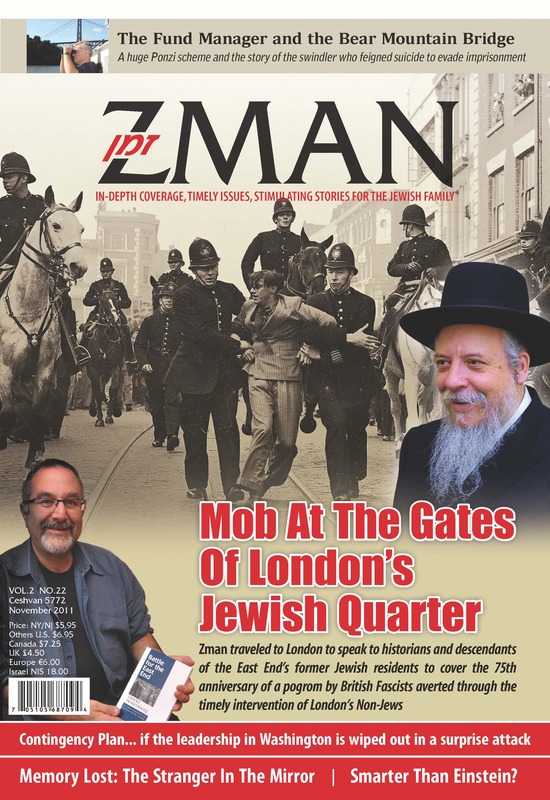 This entry was posted in Rubashkin, Zman Magazine and tagged Leo Frank, Linda Reade, Rubashkin, Zman, Zman Magazine.